Most vacationers complain that their trip seemed too short — that “I was just starting to slow down.” Days passing too quickly definitely was not my experience when my wife Daya and I spent eight days at Turtle Island in Fiji this October. Time disappeared. The holiday felt endless, as if more experiences always awaited. I fell into the rhythm of nature and the Fijians. Since I was on an island, the passage of high and low tides became important — their times even appeared daily on the Bula Board. The shifting water levels changed the view from my beach hammock. I developed a relationship with the two birds that visited during low tide to feed on the small crabs — so much so that I became concerned if they were not there! Paradise may lie far, but it’s comparatively easy to reach. A 10-hour overnight Air Pacific flight (see Travel Tips sidebar) from Los Angeles to Nadi, Fiji, arrived in the early morning. After the decent night’s sleep on-board I enjoyed the exhilaration of my first seaplane ride. One half-hour of flying at 1,000 feet over the changing shades of blue water to the Yasawa Island group culminated in an ever-so-gentle landing in the lagoon fronting Turtle Island. Speaking of lagoons: Turtle Island served as location for the 1979 film The Blue Lagoon starring Brooke Shields, imprinting it as the quintessential tropical island. 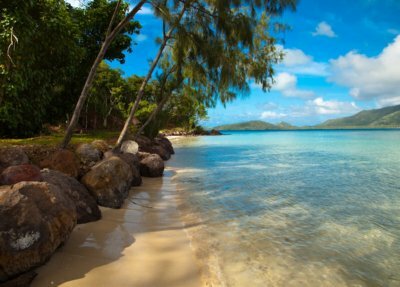 An integral escape for the rich and famous, Turtle Island has hosted the likes of Britney Spears, Charlize Theron, Ringo Starr, Rupert Murdock and football hero Kurt Warner, to name just a few luminaries. But all glittery chitchat ends there. At Turtle Island everyone was treated with equal respect and fabulous service. In shorts and T-shirts we were all on an equal footing. No flashy jewelry or expensive cruise attire. What we all shared: wide smiles and an appreciation of where we were. With a maximum capacity of 28 guests housed in 14 “bures” (pronounced boo-rays; bures are small cottages) on the expansive beach, a staff of 90 kept the place running. Half of the guests were on their honeymoon and the remainder of the visitors were celebrating some special event or just needing to get away. Over 50 percent of the guests at Turtle Island are returnees. Once on Turtle Island, you join a Fijian community. The staff live on the island and visit their own off-island families during frequent breaks. 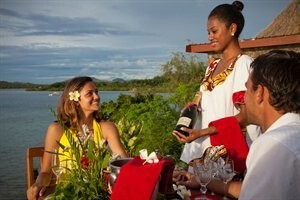 Guest constantly interact with the staff, exchanging shouts of “Bula!” (hello). Each evening a different division of the staff (kitchen workers, maintenance crew, etc.) sponsors the kava ceremony. Guests and staff participate in this ritual drinking of a brew made from the yangona root. Drinking this mildly intoxicating beverage forms part of the social life of Fijians and other South Pacific cultures — a time for singing songs and reviewing the day’s activities. Now about the luxury. Our bure was more of a small house than a bungalow. The resort manager, Felipe, brought us to our accommodations that first morning of our arrival, and excitedly showed us the beautiful writing desk, four-poster bed and cabinetry all made from exquisite local hardwoods. Many afternoons, I lay in bed and marveled at the intricate inner-roof design of pillars and woven palm set off with cowry shells. We even had a hot tub with wraparound windows overlooking tropical foliage. When we arranged our trip we were given a “customer service agent for life.” In advance of our arrival we received the list of wines Turtle offered; when we arrived, our favo-rite champagne was already on ice and our choices of wines stocked in the cabinet. Since we had been told of the Bose stereo system, we brought along some of our favorite CDs to set the stage. Within moments of arriving on the island we met Tommy, our “Bure Mama” (actually Bure Papa since he was a guy). It is difficult to describe the role of the Bure Mama. Although the practice might be unique to Turtle Island resort, it actually is an extension of Fijian hospitality. Tommy was there to take care of our individual needs. Fifteen minutes before breakfast, he took our orders so that our meal and espresso coffee awaited us when we arrived at the table on the beach. He provided the endless profusion of hibiscus flowers that appeared everywhere: in the foot-bath in front of our bure; on the bed in the afternoon; on our vanities in the dressing area; woven through the indoor tropical plants. When I returned from a scuba dive, Tommy had a fresh fruit drink waiting. Romantic interludes and privacy are keys to the days at Turtle Island. Every other day we could spend the afternoon (or morning) at any of the seven isolated beaches that inlay the island. At the designated hour, a boat or electric cart took us to the strand of our choice where we would have the white sands and palm trees all to ourselves for as many hours as we desired. Selected beforehand, our picnic meal accompanied us to the site. How often do we get a chance to have a beach all to ourselves! We had walkie-talkies with us in case we needed additional items or wanted to extend or shorten our time at the beach. Each day the most difficult choice became returning to a beach we loved or venturing to a new one. Although we enjoyed dining with all of the guests at the main dining table magnificently set on the beach, a few nights we chose to eat alone. We had the unique experience of dining on one of the floating platforms in the middle of the lagoon. A canopy of stars and the rising moon enhanced the romantic setting. Our platform was lit with kerosene lamps, and our food arrived by boat. As our eyes became accustomed to the dark, we extinguished the lanterns and ate by moonlight. After an hour the boat returned and brought us back to the mainland for dessert with the rest of the guests. On another occasion we dined by ourselves at the end of the dock with the entire path lit with small lamps. This time we were treated to the flapping sounds of small fish attracted by the light of the lanterns. Romance was balanced with activities. Each morning I was picked up at 10 a.m. sharp to go scuba diving, while my wife caught up on some “hammock-reading.” The sleep-in hour of 10 a.m. for diving (morning dives generally start way earlier) came about because the resort runs on “Turtle Time”: one hour later than of the rest of Fiji. The time-switch started during the filming of The Blue Lagoon to allow more daylight hours for shooting, and it stuck. The diving at sites such as Neptune’s Thumb, Bonzai and The Zoo abounded with tropical fish and the soft corals for which Fiji is famous. Although I like to view fish from under water, several guests went out each day to experience the thrill of deep sea fishing, also included in a stay at Turtle. They returned from their trips with tuna and mackerel, which the island chefs turned into delicacies such as sashimi at the evening meal. Back on the island itself we had the opportunity to bike along miles of dirt roads that crisscross the palms and hibiscus flowers. Early morning was my favorite time: the birds were declaring the day and the air was still cool. Another early morning offering was the sunrise horseback ride. Although we didn’t go ourselves, several couples said that it fulfilled some of their own fantasies. On the last afternoon on the Island, as we walked along the dock to our waiting seaplane, Tommy, our “Bure Papa,” placed a garland of flowers around our necks. After some hugs and farewells we boarded the plane with the scent of the flowers and the sea breezes filling the plane. After takeoff, the pilot asked for our garlands, which he then threw out the opened windows (flying at 1,000 feet makes an open window a fun experience). The custom of throwing the garlands and having the tides bring them back to Turtle Island insures that we too will return to this timeless paradise soon. FOR MORE INFORMATION on Turtle Island or to make reservations call . View their website at www.turtlefiji.com. E-mail: usa@turtlefiji.com. • Getting There: Air Pacific offers 747 direct service to Fiji from Los Angeles three times a week, plus flights three times a week from Vancouver through Honolulu: Tel. ; Website:www.airpacific.com. • Children in Paradise: Twice a year — from the second week in December to the second week in January, and for three weeks from late June until mid-July — Turtle Island runs a special program for children accompanying their parents. Called Na Vonu Club, the program matches each child with kids of their own age, as well as their own Bula Playmate or childcare provider. Children dine with other campers except for a few evenings when they eat with their parents. Daily activities range from fishing and horseback riding to snorkeling and water polo. • Getting Married: Weddings are a natural at Turtle Island. Couples can choose either an intimate private wedding on a secluded beach, or the full Fijian event with flower-studded wedding barge (see photo), choir and all island guests in attendance. • “Client Manager for Life”: When someone makes a reservation at Turtle Island, the guest is assigned a personal customer-service representative who e-mails photos to a list of selected relatives and friends. This client manager made sure that a favorite champagne awaited visitors on arrival, and that their choices of red and white wines were stocked in their bures. • The Ultimate Massage: Upon arrival guests are offered a free one-half hour Lomi massage in the privacy of their bure. Guests can also make appointments for a two masseuse, four-hand version. Not to be missed!